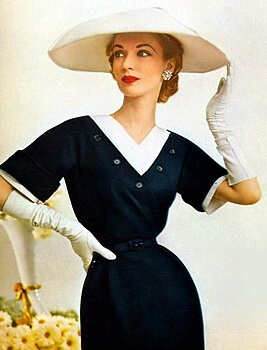 1950s Fashion – Hats, were a necessity for the well dressed woman (or man). The choice of hat style, color and material was almost limitless. 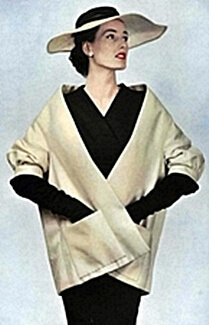 Designers kept getting more avant-garde but traditional styles were the norm. 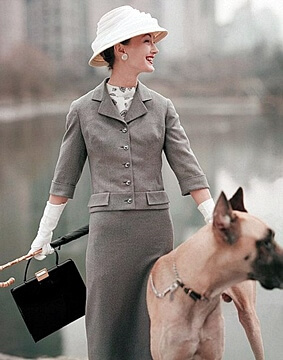 Haute couture designs often included a matching hat and department stores would always feature coordinating hats with their everyday clothing displays. The 1950s was the last real heyday for hat makers. Popular since the turn of the century, the casualness of the 60’s and onward saw the demise of many of the large haberdasheries. Hats are still worn today but usually to very formal or special events. The Kentucky Derby is probably the best example of this as is any Royal wedding in the UK. 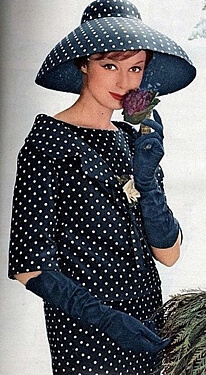 This entire outfit is Christian Dior including the modified Mushroom style hat. Notice the animal print fabric on the brim. This is definitely a designer touch. This vagabond style hat was purchased to coordinate with this coat and outfit and possibly other outfits in her closet. Notice how put together she is. Matching or coordinating coat, outfit and hat. 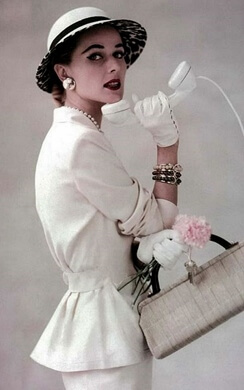 Gloves and a subtle string of pearls with matching earrings. She was prepared to go out in the 1950s. 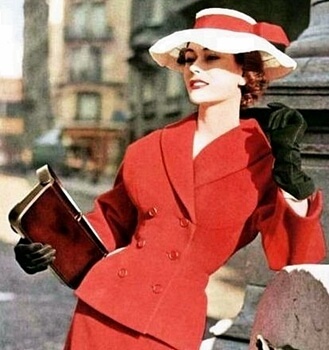 Jean Patchett was one of the top fashion models of the 1940s and 1950s. Here she is wearing a designer suit with a contrasting hat. 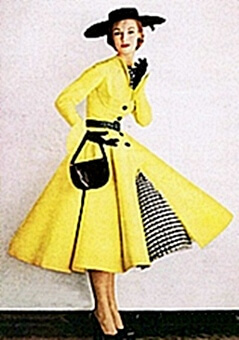 This outfit was put together by Sacony of Palm Beach for a “Better Sportswear” ad in Vogue, 1951. 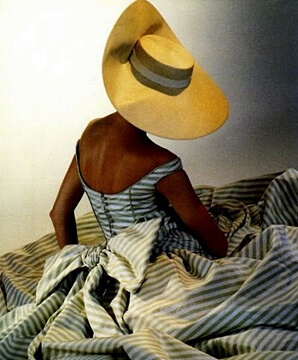 Jean Patchett in Vogue 1951, modeling a wide brimmed sun type hat in a coordinating color for Sacony of Palm Beach. 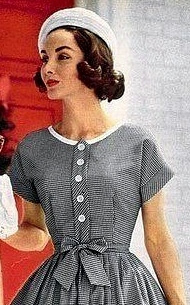 A pale look was preferred by most 50’s women so wide brimmed sun hats were a popular accessory. Unlike modern sun hats these hats were made to go well even with dressy daytime outfits. This cap was patterned after the Cloche hat which was at the height of its popularity in the 1920’s. 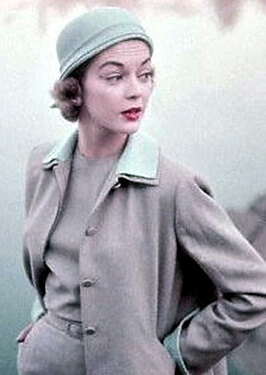 This is Jean Patchett again modeling a wool Bergdorf suit with matching hat. 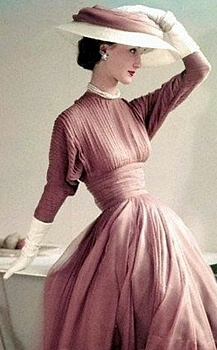 Soft, feminine, romantic…these words can be used to describe 1950’s fashion hats. 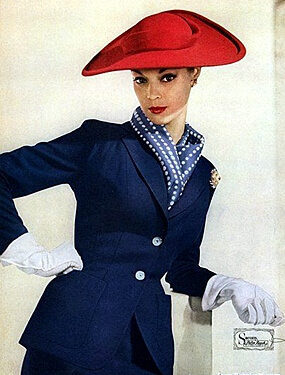 This Christian Dior suit is softened by the addition of this feminine hat. Used by military’s since the 1800’s. The 1920s saw mass production of the beret, with the hats being favored by the working class in France. 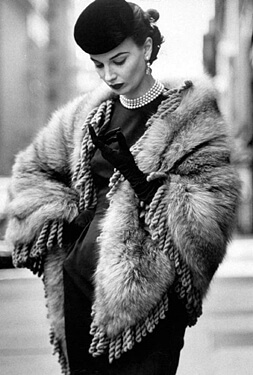 They were inexpensive enough so that the 1950s woman could own several in different colors. Although popularized by Jackie Kennedy in the 1960s, pillbox hats were worn from the 1930s on. Worn for their simplicity, the pillbox hat could finish off any outfit without overpowering the clothes. Designers would send bolts of their fabric to the hat factory to make a particular hat style to match the designers new line of clothing. The same hat would be made in matching fabric and also coordinating fabrics to round out the particular line. Photographers loved what hats could do for a fashion picture. 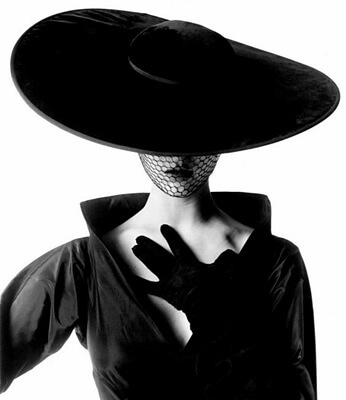 Many times the hats used were not a part of the outfit but rather supplied by the photographer as a prop. This wide brimmed beauty is probably an example of that. 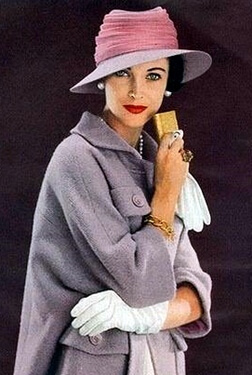 This beautiful suit and coordinating mushroom style hat are being modeled by Lucinda Hollingsworth a popular 50’s face. 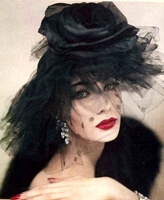 Thank you for visiting FiftiesWeb’s Fashion Hats page.